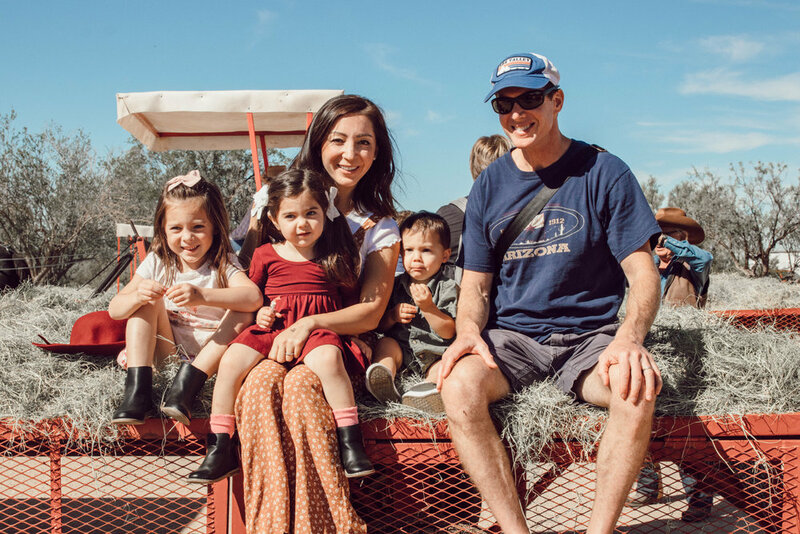 It’s no secret that when fall officially arrives in Arizona, we can all come out of hiding and finally start enjoying what this beautiful state is all about: INCREDIBLE FALL AND WINTER WEATHER! Our daily tradition to get the kids outside usually entails a wagon ride down to the lake where we like to feed the ducks and other birds that pay a visit near our home. When we decide to get out and explore, pumpkin patches are usually TOP on our list! My main goal from this post is to provide a helpful list of family friendly places to visit. I included both indoor and outdoor fun to give some ideas if you need help on a rainy day! MacDonald’s Ranch: this ranch is very close to us so it’s an easy outing for the family. They have hay rides, pumpkins, a petting zoo, pony rides, and tons of outdoor games for the kids. wear closed toe shoes because it is VERY dusty. It’s also good if you want your kids to do pony rides or pay a visit to the animals inside the petting zoo. Mother Natures Farm: This place has the best set up for everything pumpkin-spice and treat-related when you first walk in! They have bouncy castles, an area for you to walk and pet goats, mules, and some chickens, but it is NOT a full blown petting zoo. You can pet from outside the fence. Mortimer Farms: If you are up for the drive up North I promise this one is worth it! They have everything from gold mining, to pony rides, hay rides, and THE BEST FOOD! Everything they sell for food is made right on their farm, even the beef in their corn dogs! Don’t miss out on their curly fries they peel right in front of you! This place can get a bit pricey, so I’d recommend going on line and purchasing tickets before-hand that are all inclusive for kids activities. Schnepf Farms: Such a cute place for the whole family. Be prepared to spend an entire afternoon or morning here because they just have that much stuff! From homemade pumpkin pies to train rides, and live music, this farm has it all set up! I’ve gotten discounts through Fry food stores canned food drive or even checking online through their website for promotions they run during the middle of the week. McCormick Stillman Railroad Park: outdoor trains, merry-go-rounds, and playgrounds. This place is one of our favorite places to visit in the fall and through the Christmas Holiday season. We always make sure to get an ice cream at the end of each visit! We usually buy an annual card because they charge per ride on the train and merry-go-round so check out what they offer for memberships. Luci’s At the Orchard: this place is the cutest for a mommy-meet-up. Yummy lattes, salads, breakfast sandwiches and fun little splash pad for the kids! Bearizona: Ready for a drive up north? This place is a must if you’re near Flagstaff. All the fun wildlife that you don’t get to see up close and personal at the zoo is offered here! Wildlife World Zoo: believe it or not, my husband and I prefer this zoo over the Phoenix zoo. It’s further out in Litchfield Park, but they have unique things like a gondola ride over all the animal habitats, a water log ride, and a train that takes you into their safari land. If you go two times within a year it pays to get their annual membership. Odysea Aquarium: aquariums are great places to visit when it rains and also when its too hot! We come here at least two times a month and can spend the whole morning walking around and exploring, touching sting rays, walking through tunnels of sea life and so much more. Cafe Au Plait: a local cafe that has a cute play area for kids and the yummiest coffee and waffles for momma’s and daddy’s. Barnes and Noble: this is my go-to spot for when it rains! The kids can run around in the kids section, pick out a book to take home, and momma can get her fill of Starbucks. Double win! Butterfly Wonderland: this is right next to Odysea aquarium and you can definitely walk through it quickly or take your time to experience and photograph butterflies landing on you!